No one should be deprived of the fun generated by playing pool. For this reason, companies have come up with small pool table versions, which allow people to play to their heart’s desire, but without paying a fortune or needing to get a bigger home to make the table fit. These mini versions are very close to the real deal, while being a lot more versatile and far easier to use. They allow you to rediscover the pleasure of pool when you thought the circumstances wouldn’t allow you to do so. Why should you buy a small pool table? Why purchase a mini model when you can have the real thing, a large, classic pool table? The reasons for this are actually not to be ignored. It is about price, convenience, ease of installation and use, as well as versatility. Read more about these aspects below. Small-size pool tables can work as kid’s pool table really well. Their small dimensions help kids adapt easily and quickly and develop their playing skills seamlessly. If you have youngsters in your family and they feel attracted to this game, then you may want to facilitate their learning this way. It would be too difficult for them to play at a large table meant for adults. In fact, they may never succeed. Kids are often highly interested in the game of pool. Once they get into it, they will forget about unhealthy activities like spending all their free time on the Internet. Living in a small house or apartment should not be an impediment to buying and using a pool table. These small-size ones are far more suitable to a restrictive space and will still allow you to gather your friends around it and play. This also works well when you feel like such a piece of furniture wouldn’t match the style of your home and therefore would only unfold it when it’s needed, storing it away for the rest of the time. It is fairly easy to manage a small version. Unlike the usual big pool tables, these are a lot more manageable. The large ones require disassembling piece by piece and then putting them all back together. Or, certain types can be moved around by using special tools and wheels, which is also a very risky and time consuming business. Usually, several people are needed to move such a heavy table around. Instead, when you get a small pool table, the weight is considerably lower and there are easier methods to move it from one place to another. The small tables are simply folding ones and who wouldn’t wish their billiards or pool table was like this? You can store them away easily, whenever you want, as well as move them around and place them in various rooms or outdoor spots. You’ll never have to worry about getting them through the door or installing them in their designated place. A folding pool table is the most convenient innovation in this field. You can spend only a few hundreds instead of thousands and yet you still get a fully functional item that can last for years. Read the reviews below to see the models to purchase that won’t let you down. You can even buy one for a bit over $100, as there are significant discounts. The reduced size makes the game accessible to everyone. The low weight and portability lets one move this table as pleased. Feel free to place it in a man cave, in a game room or a kid’s room, outside in the garden or in the living room when you have guests. Any gathering or party can be turned into a highly entertaining event by simply unfolding the table wherever you want to. Let the fun begin! We have selected 5 of the best, affordable, feature-rich and popular small pool table models for you, to select the right one for your home with more ease. This is a unique 6-feet table with excellent portability and a great fit to small rooms. You get a 66 x 33-inch playing surface and looks just like those large, pricey models. The steel leg system folds easily and can also be fully stabilized. The appearance is stylish: black melamine body with a matte finish and a beautiful blue felt, which is a blend of wool and polyester. You’ll feel great about unfolding this and showing it off to your peers. Also, the shade of blue is well chosen – a nice departure from the usual green. In addition, the well rounded corners make for a nice touch, as these are chrome plated. The melamine edges are durable and can take shocks without showing damage. On the felt, the ball rolls nicely. It’s surprising to have such a great felt quality with this model. The legs are made of a strong metal but can be folded without much trouble. The pool table comes with all the needed accessories for pool, as well as with a bag for storing it away. The bag is resistant to tearing and can also be used as a playing surface protective layer if placed on top when the table is standing. Although some may consider this model to be rather large, it still makes a good kid’s pool table. The weight stands at about 160 pounds. This helps make it stable enough. If you need to carry this from a place to another or up some stairs, make sure you have a helper with you. As for the accessories, the package is complete so you won’t need anything else, regardless of the level you’re playing at. The balls that come with the kit are sized at 2 ¼ inches and the material is by no means a lousy one. The felt, once worn out (although it resists well in time), shouldn’t be impossible to replace. The legs allow for a few adjustments to be made. All in all, this table that’s on the smaller side is kid friendly but still a great option for adults. It has all the needed features, while at the same time making a compromise and letting you play pool wherever and for an affordable price. For what it is, it is simply awesome – just don’t ask more of it. It is like half of a real table and everything is downsized, but it certainly reaches its purpose. 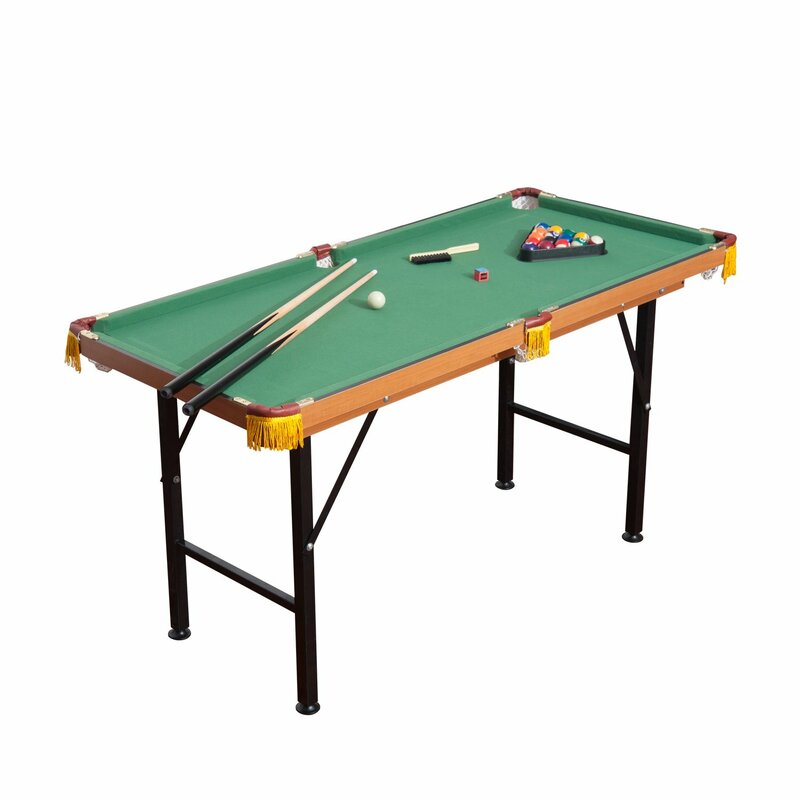 HLC’s Green Billiards Foldaway Table is suitable to both pool and snooker games and comes with all the needed accessories. The current version is a major improvement of the former package. The table has 2 x 48-inch cues and two ball sets – one for snooker and the other for pool. Only few other models are like this. Usually, should one wish to change the game, they must purchase an additional set of accessories. This issue is eliminated with the complete HLC package. 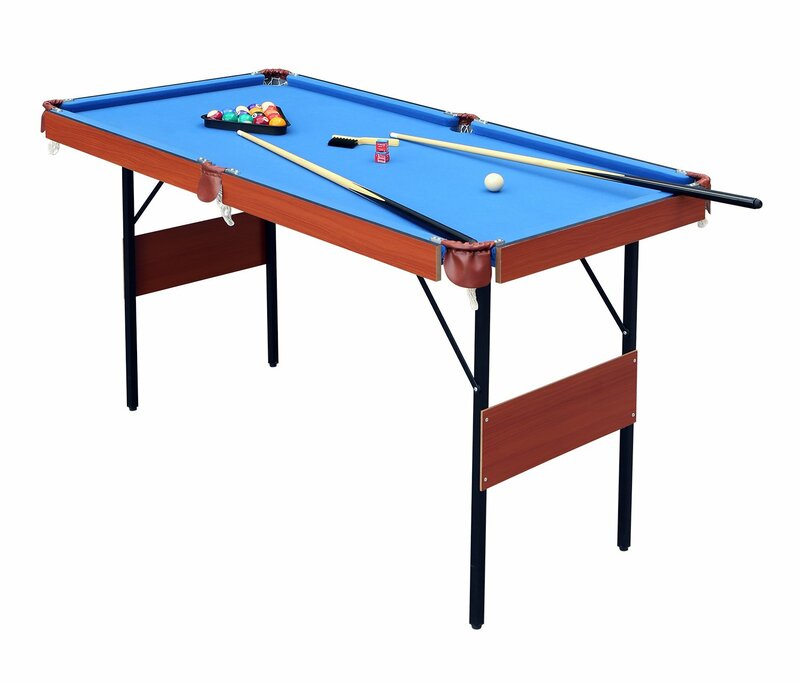 Considering its small dimensions, this table is suitable for adults and children, who can start learning how to master the rules of snooker or pool. Its design is outstanding. The frame has a beautiful and elegant wooden finish and the surface is bright green, like with all classic tables. The positioning of the legs is unusual but makes for a great aesthetic effect. This design is indeed a special one: the legs are all inclined to one side but the additional parts make this a very stable piece of furniture on leveled ground. 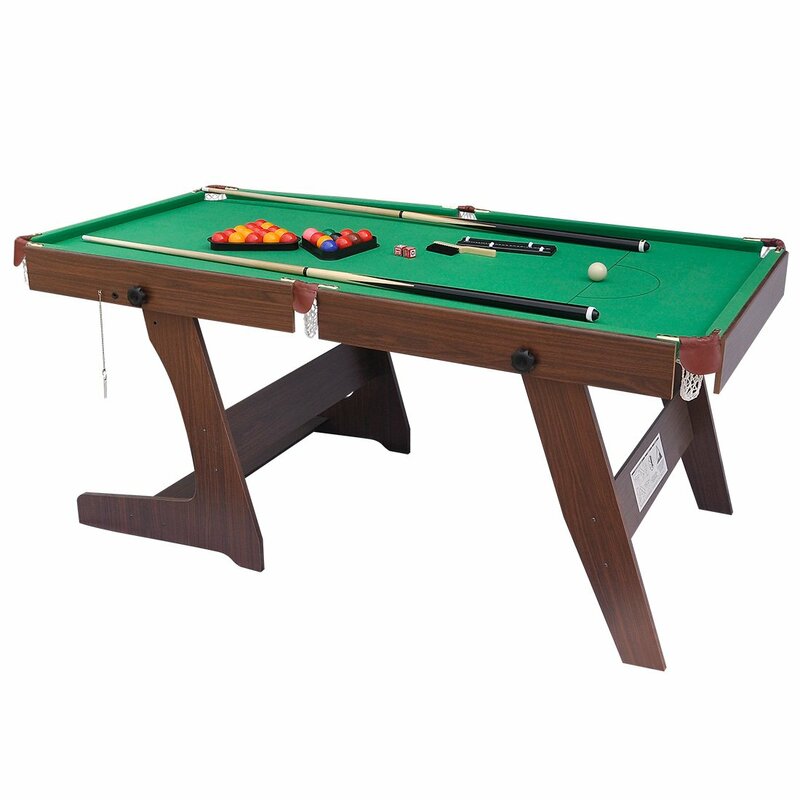 The 6ft Green Billiards Foldaway Table belongs to a special range. It is a small pool table that fits in apartment rooms or student dorms, for example. It folds vertically and can be easily stored away. The biggest advantage of owning it is, besides being able to play two kinds of games, the possibility to move it around as desired or simply storing it somewhere out of sight when it’s not in use. Because it’s a lightweight, portable pool table, you can change its place with ease – there is no need to fold it to do that. Have it installed wherever you wish, even outdoors, but never leave it there unprotected. Since it is a folding pool table and does not have the usual dimensions of a full size version, nor its built, one shouldn’t put additional weight on this table. Children should not be allowed to climb on it. It is, after all, a more delicate structure than the massive pool tables that can barely be moved around. To ensure its stability at all times, have it placed on an even surface. One last note: this miniature pool table may be easy to use, but there is one challenge in the beginning: assembling it. It comes in separate pieces, so you have to put them together. Most likely, you will need someone to help you with that. Large and folding – what more could one possibly desire? 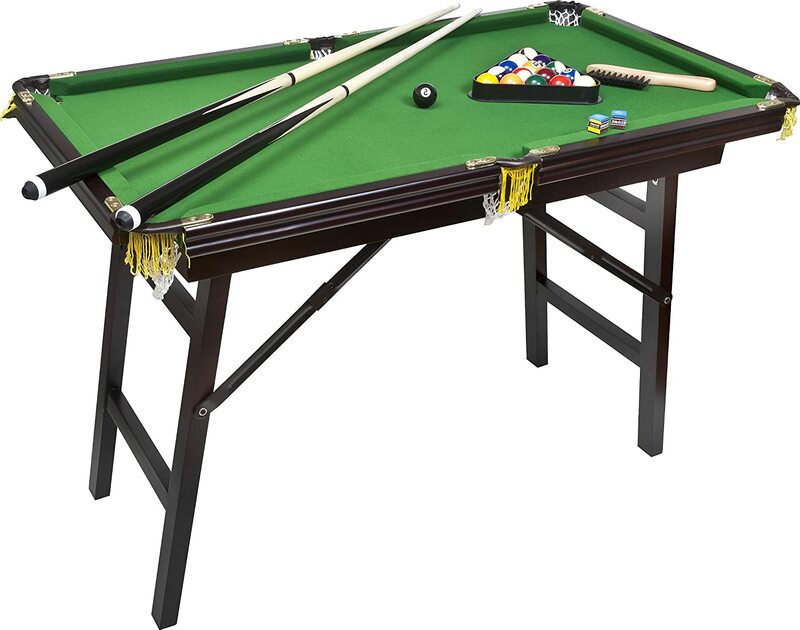 The Deluxe folding pool table from Bello Games New York is labeled as an ‘extra large’ one, measuring 44 inches (albeit still in the ‘small’ range). This comes with true billiard balls, sized at 1 ½ inches. It looks just like a professional table, only that it is downsized and made to be folded easily. It’s so simple it doesn’t even require any assembling. As you receive it, you only have to unfold and it’s ready for the game. Besides, it is just as it looks: sturdy and reliable. Do not expect to be playing like you would on a large pro table. Still, the materials used here are of good quality and the game can go smoothly, as long as the users are used to everything being downsized. The casual player is expected to enjoy it. In fact, it is best to simply say that it’s suitable to the entire family. It’s on the heavy side because of its hardwood legs but at least it looks fancy wherever you place it and can suit a more classic interior. The frame is made of hardwood – not many small pool tables can boast with this. The felt surface contains wood fiber and lets the ball roll smoothly. The legs do not have levers to ensure stability, but these can be purchased and installed. However, this required great care, as to avoid splitting the wood. Drill carefully in order to succeed. There are many ways in which one can store this table, which is a big plus. You may even have it standing in a closet. To conclude, this is a great choice when you can’t have a full size pool table. As for the game performance, expect a realistic pool experience; the balls are heavy enough to allow for that much needed resistance. It doesn’t feel ‘light’, weightless. Of course you will be paying a little more because of the hardwood, but it is worth it. This is a mini table that can be used even by the seasoned players, who would otherwise lack the enjoyment. The Artdid 47″ Mini Foldable Portable Pool Table Billiard Table seems to be the ideal full set for those who are planning enjoyable game nights with family or friends. It is even suitable for children, who can now really get into billiards. This is a small pool table and does not have the advantages of a full size one. However, it also lacks the disadvantages. Being so much lighter, it is easy to carry from a place to another when you get bored of the setting. The length and width of the surface are of 47”, respectively 25”. the legs are slender and can be folded. This makes your billiards table very manageable. All in all, the design manages to save a lot of space regardless of the table being in use or not. If you are looking for a portable pool table, this should be it. It weights about 20 kg or 44 lbs. Its parts are made of various plastic types, but also of wood (pine). In the package you will get 90 cm long cue sticks, a set of balls, a brush and chalk, plus the triangle rack. When you play on this miniature pool table, you feel it very close to the real billiards experience. This is because of several of its features. First of all, the playing surface is covered in a high quality fleece which is made of polyester. It may not be what other manufacturers use, but it is a resistant material that will last well in time and allow for nice speedy rolling. The ball will be like gliding on it with ease. In addition, the side bumpers are rubbery and covered in the same type of material. These ensure a good bounce. There is one element that may ruin the design for some, but it does not affect the game: the woven pockets. However, if you feel you can ignore these, you will be enjoying the advantage of having a folding pool table that’s lightweight and nicely built. It may not look too sturdy so don’t push your luck: don’t let the kids sit on the table and avoid placing weight on it. If you’ll be taking care of it, it will give you many hours of good fun. You will not be ashamed to show this pool table to your friends. 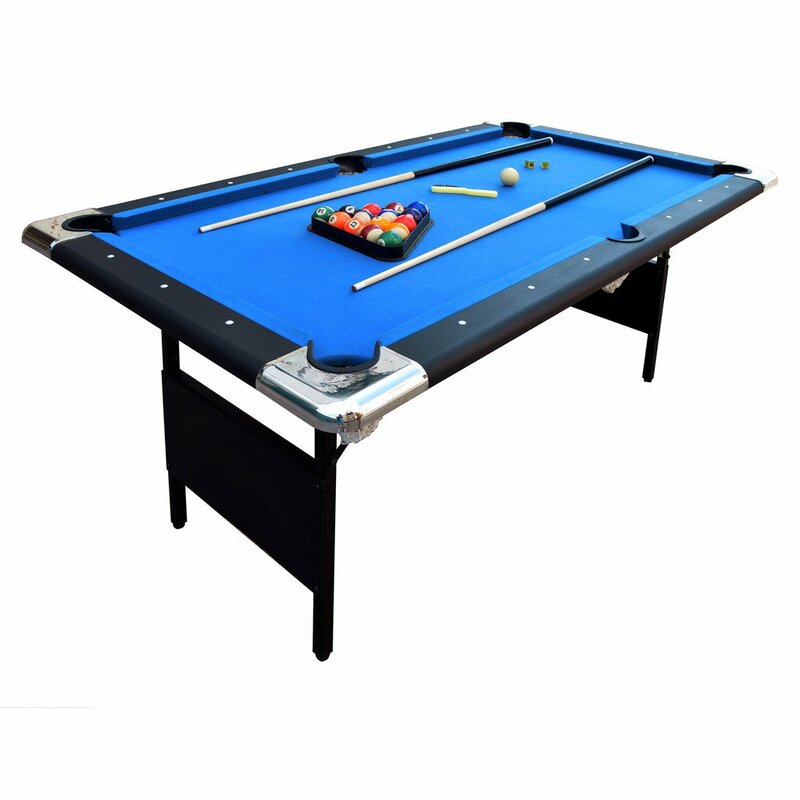 The slim design, modern materials and folding legs of this small pool table will easily convince you it’s a perfect choice for small interiors, as well as for people who want to be able to play pool here, there and everywhere. It’s also got the complete kit: real billiard balls, cues, chalk, rack and a brush. The wooden parts give this table character. There is no assembling work and the leg system allows you to get this table up whenever needed, or to store it when it’s not in use. Thus, you actually don’t need a bigger home to accommodate a pool table. When you want it out of the way, fold it flat and place it vertically or store it horizontally, under a bed. This miniature version measures 55 inches and is both child and adult friendly. Its height is of 31.5 inches. It will ensure all the fun expected from a game of pool. The balls are of great quality, but aren’t full size. It can be said that these are about half of that. What could be more surprising is the length of the sticks; these are about half of what we know of real cues and are seriously lightweight. Consider this aspect when buying, as it will have an effect on how the game feels. For this reason, it may not be ideal when you want to practice for a real, full size game. However, it will ensure a challenging and fun game for the entire family. The rail is made of a good material and it adds bounce, in spite of it being lightweight. There are no complaints in regards to this model, expect for the light sticks. These, however, can be replaced with better ones. The package will still be worth its money, even when you choose to do so. Do not go too heavy with it though. Even if the balls are solid enough, using full force is no good idea. This stays a rather delicate small table, like its appearance suggests. It is not as sturdy as its hardwood counterparts. Pick it for your kids and they will be happy with it. This is perhaps its best use. Note that this model will require a bit of work in the beginning. It doesn’t come readily assembled but anyway, all you need to do is to place some screws correctly and it’s done. Anyone can do this. Do not be mislead by the label – it says ‘snooker’ but it is definitely suitable for pool, so have no worries. The ‘kids and amateurs’ level’s the best suited. Pretty, slim and colorful, this mini pool table is a dream for those who have little money to spend on this and little room inside their homes. Small as it may be, and definitely kid friendly, it comes with real billiard balls and is readily assembled. All you have to do is to unfold it and place it wherever desired. When you get bored, move it to some other place. Simply fold its legs when it’s not in use. With a height of 30 inches, this is a better choice for adults than for kids. Still, what you get with it are, of course, miniaturized cues and balls. Unlike many other half-size models, this one actually comes with high quality cues, not as lightweight as expected. This is sure to make a statement and will allow the players to feel the game better. The cues come in halves and you will have to screw these tightly. The final size will be at about 2/3 of a real cue, which is far better than just half of it. In spite of this, however, it doesn’t mean one can play exactly as on a big table. The force used must be kept to a lower level, do not be fooled by the realistic feel of it (although it’s such a big plus for this model). Bear in mind that CHH is an expert manufacturer of all sorts of games and similar equipment. It is a guarantee of quality and a promise that you will have your expectations met. The only real downside is that the pockets are too tight and there isn’t enough of a bounce from the rails. With a length of 47 inches and a weight of 43 pounds, this portable pool table can find its place in any room and can be moved around effortlessly. Besides, the kit is complete and is good enough on its own, so no need for extra purchases. For its slim look, the table is rather sturdy, thanks to its good make and materials. Plus, it manages to stand on its own very well and needs no additional support. The balls have enough weight to it and feel genuine, which makes for a solid practice. There is a lot of realism to this kit, although the rolling doesn’t exactly match the big league experience. This makes it excellent for practice – kids will be delighted to have it. There will be a bit of a struggle if the height doesn’t match, but it will still be useful and attractive to them. Voit 48” is extremely attractive through its clean design with so many of the traditional elements. It has a compact built and looks like something to last. A thorough inspection shows that Void 48” has no flaw. Its diverse materials are well put together, the corners are rounded and the screws are tight. Its dimensions and proportions are nothing but perfect for stability and very pleasing to the eye. You may be instantly seduced by the green surface with the brown wooden frame, but there are other colors available, too. The rubber side bumpers create a great rebound effect that will help play in a more realistic way. The drop pocket design was taken from the professional range. Small as it may be, it lets adults play too and creates a fun experience. Kids can easily learn how to play and will get to love this new activity. It isn’t so suitable for those under 12, although some buyers claim that it fits well. This is a portable pool table that comes with something extra: it has adjustable legs. Thus, you can always make it stable, even when it stands on an uneven surface. It is a quality that is rare to find. Besides, just by looking at it you can tell it is really sturdy. It does require some care when you move it around, however, as to not cause any damage to the lower leg parts. A very nice aspect is its weight – it has below 70 pounds. This is not a table you can fold, but it can be lifted and carried around, should you wish to place it somewhere else. In the game table industry, Voit is one of the leaders. It knows how to get the whole family involved and entertained. Besides, it is well aware of all the needs of its diverse customers and especially of their concern with small rooms. 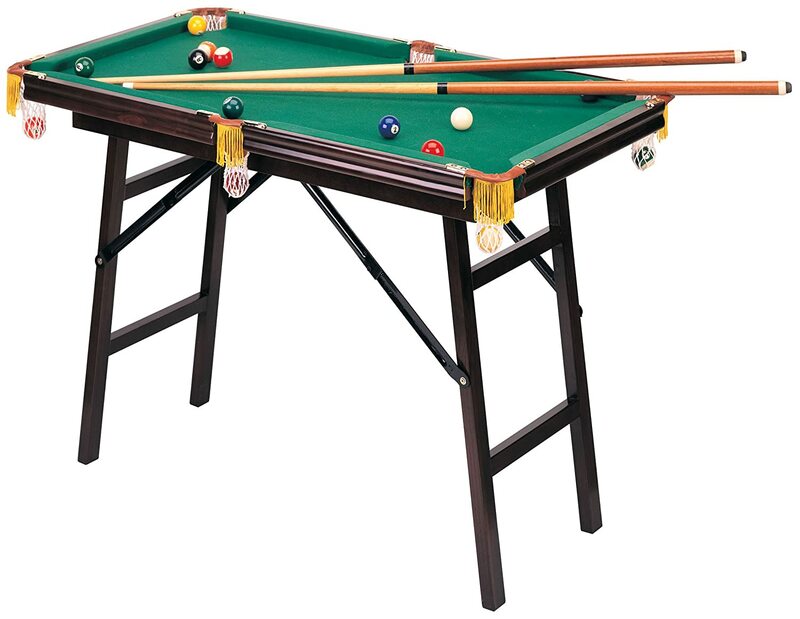 This is a full set; you get the table with all its accessories – balls, cue sticks, brush, rack, plus instructions on how to assemble it and how to play. It is good for those who are completely new to this. There is no unique system to retrieve the balls, so you will have to get them one by one, from their respective pockets. 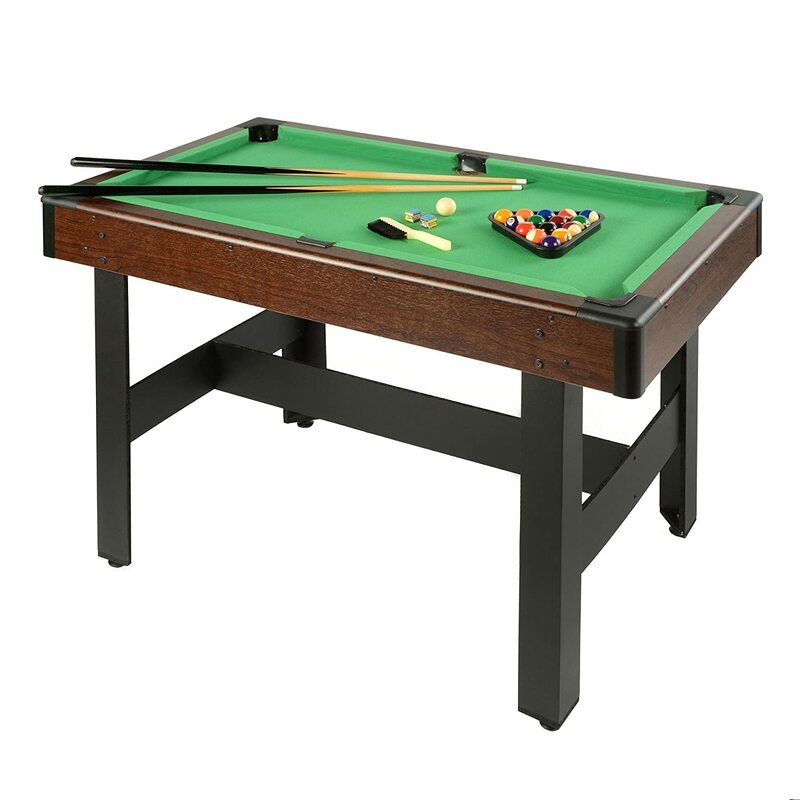 Fit for home use and is very friendly to the youth, this small pool table is affordable and does what you expect. With the bouncy rails and the heavy billiard balls, you get the chance at a good game, although not exactly like one at full size. Assembling takes about 10 minutes and playing can take as many hours as you want. 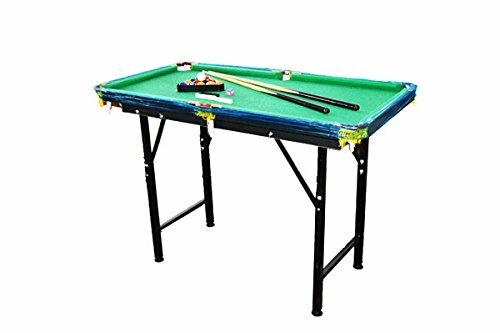 Pool enthusiasts who cannot afford a full size pool table or simply have no room for it could simply get the HomCom Folding Miniature Billiards Pool Table. With this model, the feeling of authenticity is strong. Within the package, you receive a set of ball, two cues, chalk, a brush and a rack. It’s all that you need to get started – even to start teaching your kids if you wish. Moreover, this is a miniature pool table that folds for your convenience. It can be moved out of the way when not in use and hid away. It’s this practical aspect that convinces many buyers. You get a playing surface that is 55” long, with a width of 25”. The table height stands at 29”. This is a portable pool table that tries to follow the classic design and color scheme of the regular ones, with a few differences. The surface is of a rather pale, minty green and for the edges was chosen a honey color. There are nice golden frills decorating each of the pockets. This miniature table has thin legs, but with a good support system that will keep it stable. For perfect stability, place it on an even surface or adjust its legs accordingly. In terms of performance, HomCom hardly compromised. The balls roll smoothly on the synthetic fiber fleece cloth. There is enough of a resemblance between the materials that you would see in a big billiards table and this model. The balls bounce back well thanks to the cushion on the edges and so you will enjoy the way the game unfolds. It may be a small pool table, but it creates enough of a thrill. With the skills you earn with it, you can then confidently play at a big table. Since it is a folding pool table, owners won’t have to see it as a permanent piece of furniture in their homes. This should only stay unfolded when in use. When you don’t need it, simply fold its legs flat and place it under a bed or in a closet, as it takes up very little space. All that is needed is to accommodate its 55-inch length. Its weight will also be an advantage. It comes as a surprise, considering the rather large size for a mini pool table, but it is really light. Only one person is enough to move it around. This makes the model one of the top options. As you can see, top small pool tables differ through their features. Each, however, is ideally suited to kids and adults alike. Pick yours based on the aspects that make a difference: cue size, ball weight, playing surface size, height, aesthetics and especially folding ability, if that matters to you. When you have a game room but there is little space left. When you live in a small apartment or house. When you just don’t want to see the pool table around day by day. When you’re playing just for fun. When you want to teach your kids pool and get them used to a healthier pastime than computer games. When you just can’t decide where to place a pool table and you’d rather have one that’s easy to maneuver. When buying a full size one is too much for your budget. Small, folding pool tables may surprise you. Although these are made to be carried around easily and stored away, you will find they have enough stability. At the same time, the materials can be more than you expect: from hardwood to resistant modern plastic mixtures and a chrome finish, also with excellent felt made of real wool. In addition we could mention the ball weight, which can get close to the real deal, while their size is much smaller. All these details contribute to the looks of the table, as well as to the quality of the game.